A competition that started with 736 teams in August has reached the semi-final stage, but just who will make it to the FA Cup final on 18 May? Manchester City, who are chasing an unprecedented quadruple, take on Brighton & Hove Albion, the lowest ranked club remaining, on Saturday (17:30 BST) - live on BBC One. The second semi-final is between Watford, runners-up in 1984, and Wolverhampton Wanderers, who have not appeared in the final since 1960, on Sunday (16:00). 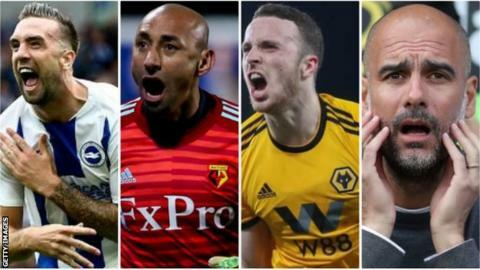 BBC Sport takes a look at some of the stories from the four clubs competing at Wembley this weekend. Brighton defender Shane Duffy will walk out at the national stadium knowing he owes everything to the surgeons who saved his life after a training ground collision. Duffy was 18 when he lacerated his liver, losing around two-thirds of his blood supply, after colliding with keeper Adrian Walsh while training with the Republic of Ireland in 2010. "The doctors told me an artery got sliced open but there was no blood, it was internal," Duffy, a key figure behind Brighton's run to the semi-finals, said. "The last thing I remember was hitting the ground hard and I couldn't get my breath back. "My dad was there waiting and the doctor came out and said 'we could lose your son'. I am so thankful for all the surgeons and doctors for keeping me alive." Duffy, 27, was at Everton at the time of his near-death experience. The Seagulls are not safe from relegation in the Premier League, a 3-0 defeat at Chelsea on Wednesday leaving them five points above the relegation zone with seven games to play, but Duffy says they can spring a surprise against Manchester City. "The FA Cup is special and upsets do happen," Duffy told The Argus. "That's what we will believe. "Obviously it's the short stick of the draw, but what an achievement for the club where we've come from." Did you know? This will be the first meeting between Brighton and Manchester City in the FA Cup since January 1983, when the Seagulls won a fourth-round tie en route to their only previous appearance in an FA Cup final. Heurelho Gomes sobbed on the pitch after helping Watford beat Crystal Palace 2-1 in the quarter-finals and there could be a few more tears yet for the veteran keeper. The Brazilian has set his sights on making a stylish end to his five-year stint with the Hornets, with an FA Cup final appearance next month. "It has been great, almost five years over here and I'm 99% sure I will retire at the end of the season," he said afterwards. "My contract will finish with Watford, and I'm 38, so I think it can be the end of my career here." While Gomes has been understudy to Ben Foster in the Premier League this season, he has been an integral part of Watford's FA Cup run which started with a 2-0 win at Conference South team Woking. "I'm desperate to win this trophy," Gomes told the Telegraph. "I'm a long time now without a trophy, so I'm missing that. "I think this is my last chance of another trophy. This cup is famous - everyone knows about it." Under Spaniard Javi Gracia, Watford are enjoying a season to remember. With six games left, they have already surpassed their Premier League points record. Will they make it to their second FA Cup final? Did you know? Watford are appearing in their seventh FA Cup semi-final. They have only managed to progress on one previous occasion - a 1-0 victory over Plymouth in 1984. Seventh Wembley heaven for sausage-inspiring Wolves? Like Watford, Wolves are also enjoying a memorable campaign under Nuno Espirito Santo. The Portuguese is proving so popular in Wolverhampton that a local butcher has created a sausage in honour of the 45-year-old former Porto boss. "The Nuno banger is made with garlic and paprika, a classic Portuguese style," butcher Stuart Taylor told the Express & Star. "One man told me they were so tasty that Nuno didn't do them justice, but then again he wasn't much of a football fan." This time five years ago Wolves were hosting Peterborough United in League One. Now they are eyeing a top-seven Premier League finish - as well as an FA Cup final appearance. Wolves have won on their past six visits to Wembley - including a 3-1 victory over Tottenham in the league on 29 December. Did you know? Wolves are on course to become the first club to win the FA Cup in three different centuries. The Black Country club are four-time winners - 1893, 1908, 1949 and 1960. Third time lucky for Guardiola? Pep Guardiola has won every major competition he has entered as a manager - bar one. The former Barcelona and Bayern Munich boss has triumphed in the Champions League, La Liga, Cop del Rey, the Bundesliga, the German Cup, the Premier League and the Carabao Cup. Yet the FA Cup remains missing from the 48-year-old's sparkling managerial CV and reaching this year's final would keep the prospect of a quadruple alive, having already won the Carabao Cup. Will Manchester City win quadruple? "In one week or three days we can lose all three titles," Guardiola said. "I said many times, ask me at the end of April. Why talk about the quadruple when in this country - a legendary country - it has never happened before? "Of course we are there but I said to the players, 'Forget about it, don't think too much'." Did you know? Manchester City have had nine different scorers in the FA Cup this season.